Ankle injury is one of the most common sports injuries, often reoccurring again and again throughout the athletes playing career. Almost every injury to the ankle happens when the ankle is rolled outwards, causing damage to the ligaments on the outside of the ankle. Most soccer players have twisted their ankle at least once, considering that rolled ankle is one of the top soccer injuries that can happen to players. This article will help players diagnose the severity of the ankle sprain and the treatment required for quicker recovery. Sprained or twisted ankle is stretching or tearing of the ankle ligaments, causing swelling of the ankle joint, and pain in the ankle area when trying to walk or run. The discomfort in the ankle area will depend on the severity of the ankle injury. Most common ankle sprain is the inversion sprain. Inversion ankle sprain occurs when the ankle is turned so that the sole of the foot is turned inside, causing the ligaments on the outside of the ankle to be stretched too far, or completely torn off, depending on how severe the ankle was twisted. Swelling and discoloring are the main symptoms for inside ankle roll or sprain. Eversion ankle sprain is very rare, but it does happen to athletes. Eversion ankle sprain occurs when the athlete twists the ankle so that the sole of the foot faces outwards, leading to stretching or tearing of the ligaments located inside of the ankle joint. 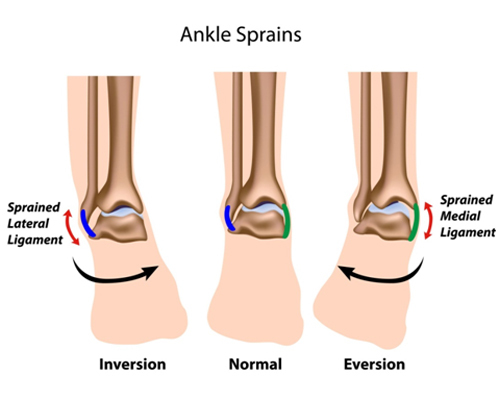 In many cases, eversion ankle sprain will also have a fracture to the fibula bone in the lower leg. It is recommended to see a doctor right away when an eversion ankle sprain occurs. High ankle sprain is another more serious injury to the ankle. High ankle sprain occurs with a sudden twist of the foot, while the foot is planted, causing injury to the ligaments that join Tibia and Fibula together (right above ankle). This type of injury is rare, and is associated with a fracture to the lower leg bone (fibula). Grade I occurs when the foot is rolled inwards or outwards only for a moment, before recovering the foot back. This causes minor stretching of the ankle ligament. Athlete should be able to continue playing with little, to no discomfort in the ankle area. There shouldn't be any joint instability with Grade I ankle sprain. Pain may be noticeable when the injury first occurs. Little to no pain should be felt when walking or running, after Grade I ankle sprain or twist. Mild ankle swelling around the bone should be expected. 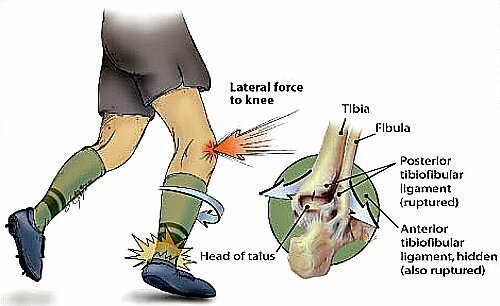 Ankle joint stiffness, causing mild pain when running or walking, once the body temperature cools down. Rice Method (Rest, Ice, Compress, Elevate) for speedy recovery. Grade II sprained ankle will cause moderate tearing of the ankle ligament fibers, leading to instability of the ankle joint. Moderate to severe pain and difficulty walking is to be expected with Grade II ankle sprain. Athlete is unlikely to be able to play on. 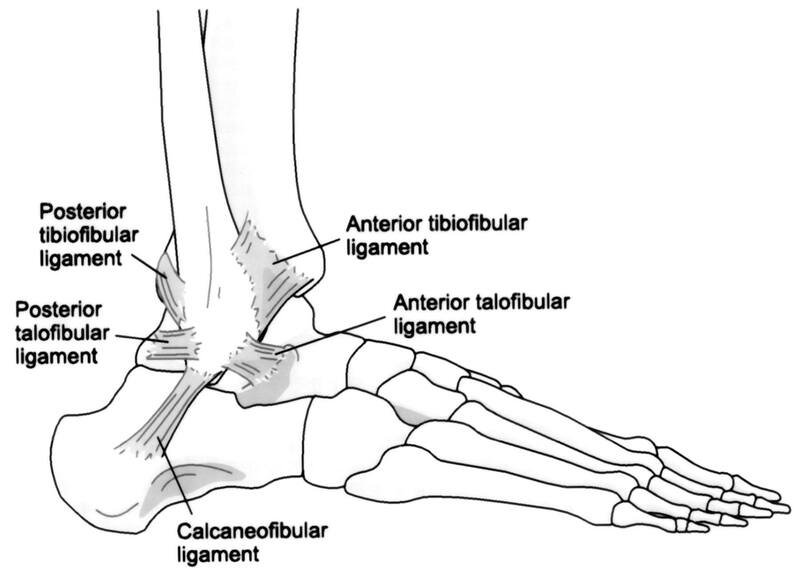 Torn ligament fibers cause ankle swelling and stiff ankle joint. Minor bruising along with swelling is to be expected. Rice Method (Rest, Ice, Compress, Elevate) for ankle sprain recovery. Grade III ankle sprain usually results in a total, or almost complete rupture of the ankle ligament. Severe pain at the time of injury and afterwards. Instant, extensive swelling and bruising on the ankle. Total instability of the ankle joint. Inability to walk or put any pressure on the ankle. Doctors Office visit is the best option for long term ankle problem prevention. Rice Method (Rest, Ice, Compress, Elevate) for any ankle sprain recovery. Scroll down for treatment and rehabilitation of ankle injuries. For more information about ankle injuries visit Sports Injury Clinic - Ankle Sprain.